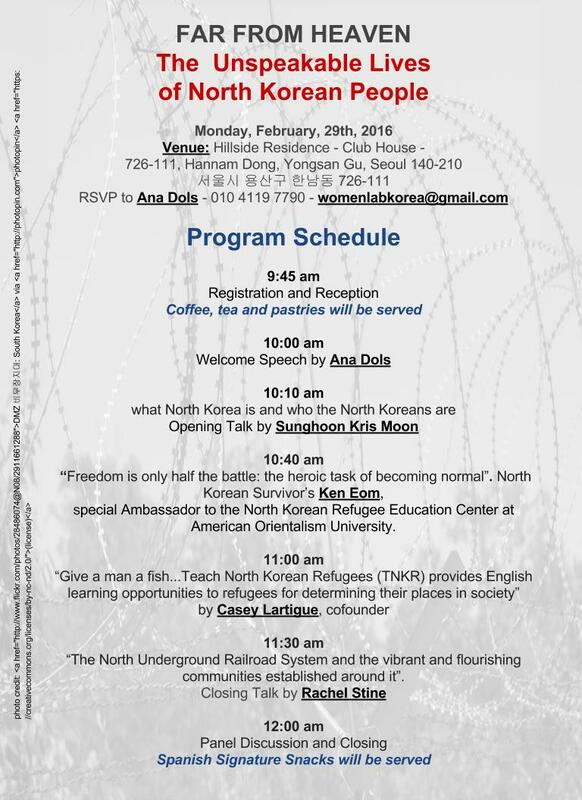 We Are Korean Women and Hansan Sogokju. On Thursday, May 7th we celebrated another #WMLABTALKS event, our inspirational thought-provoking lectures. 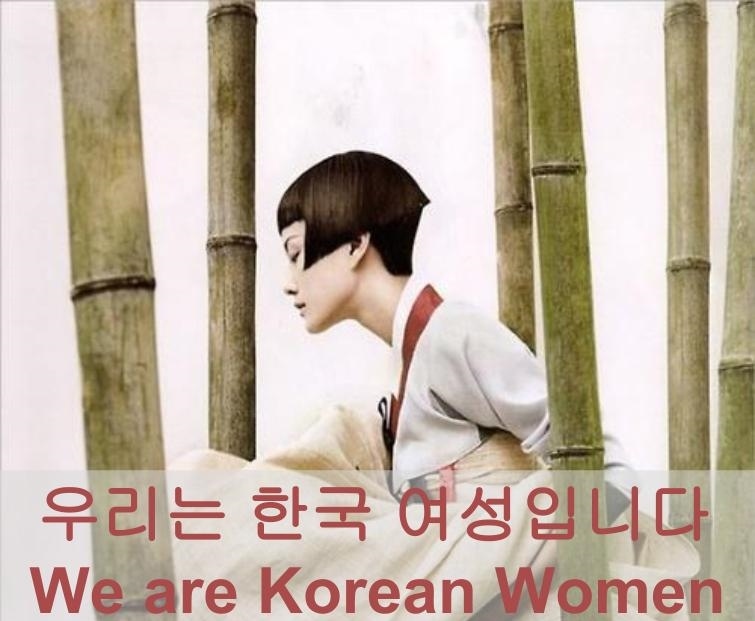 WE ARE KOREAN WOMEN! Along with Hye-Rim Kwon, a Korean journalist, we talked tête à tête about how Korean women view their past and face modernity. Hye Rim and her friends. This was our plan for the day and sticked to it quite enough. Our Schedule Program for the day. 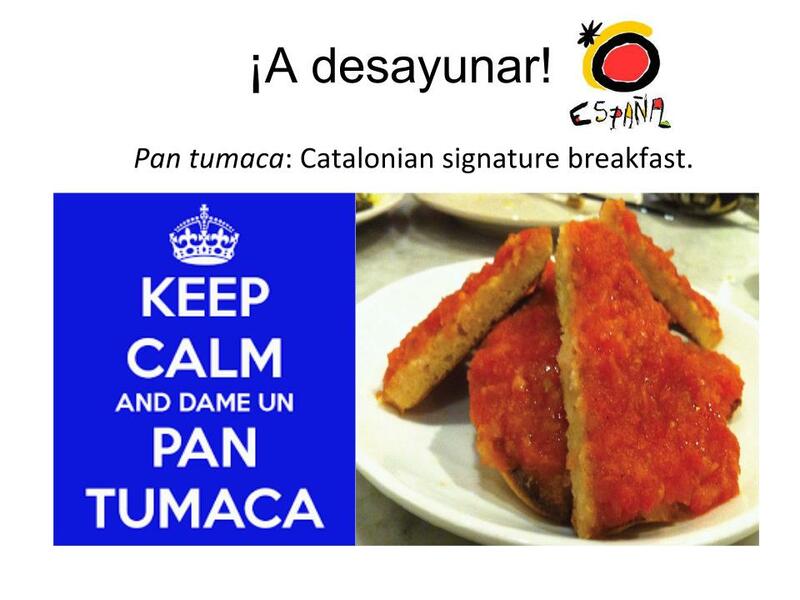 The first thing was the coffee mingle and taste the traditional Spanish tapa pantumaca, a Catalonian breakfast or snack. People loved this simple but tasty Spanish dish. You might be surprised by the name, “The Spanish FIKA” but there is a sentimental story behind. FIKA was our first #wmlabtalk and we liked very much this unique Swedish coffee break that we wanted to pay tribute to it by named it like that. We began our presentation. 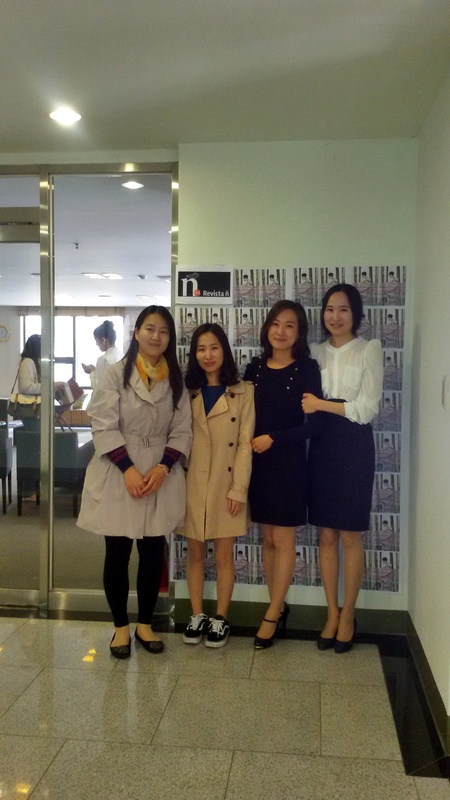 We talked about women, about Korean women and Korean Women’s greatest achievements. We talked about democracy, gender equality and the increase of women’s power in Korean society. 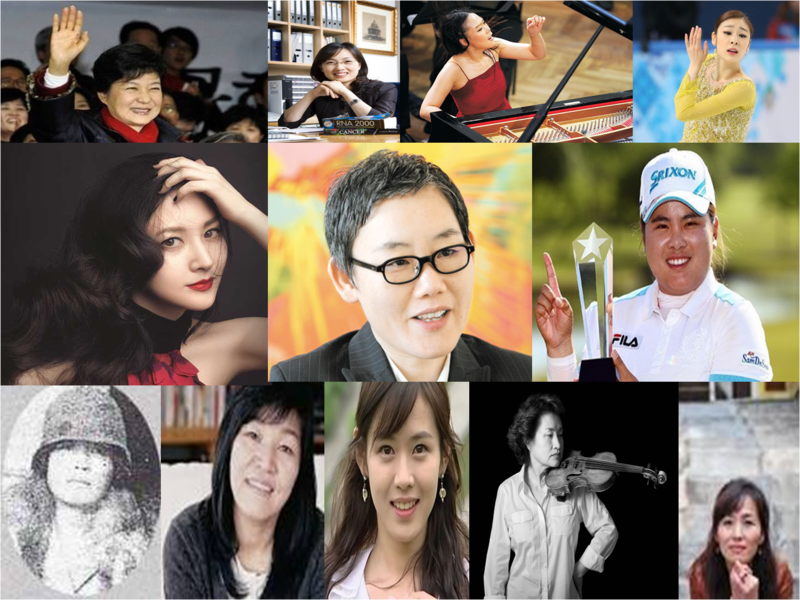 However we wanted not only to celebrate Korean Women’s achievements but to go just a little more further. More than spectators we wanted women to interact and discuss. We intended so to set a female-focused collective dialogue to break down stereotypes and go beyond clichés. It was difficult though, always is. We thought that the only way to do it properly was through a “World Café” dynamic. 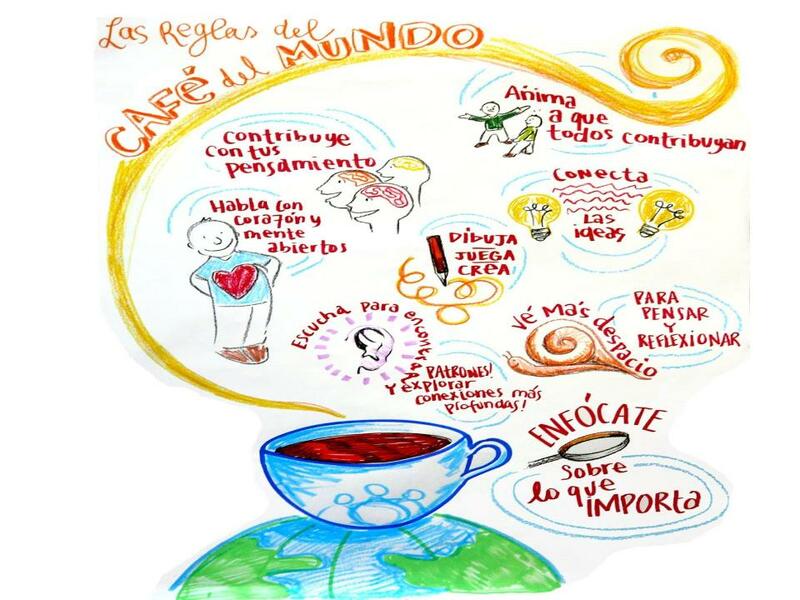 According to Wikipedia, the “World Café” is a structured conversational process that fosters an open and intimate discussion and link ideas within a larger group to get access to the “collective intelligence” in the room. In World Café the focus is on exploring on themes and not on problem-solving and that was what we were after for: to enrich our perspective on Korean Women and give a certain basis for a further intimate reflection. Small groups of six or seven participants sat around the tables and discussed open-ended questions for a structured amount of time. Individuals switched tables where a “table host” at the new table briefly welcomed people and filled them in on highlights of the earlier discussion. In this way participants gather a wide range of inputs that help strengthen the ‘ecology’ of the conversation. 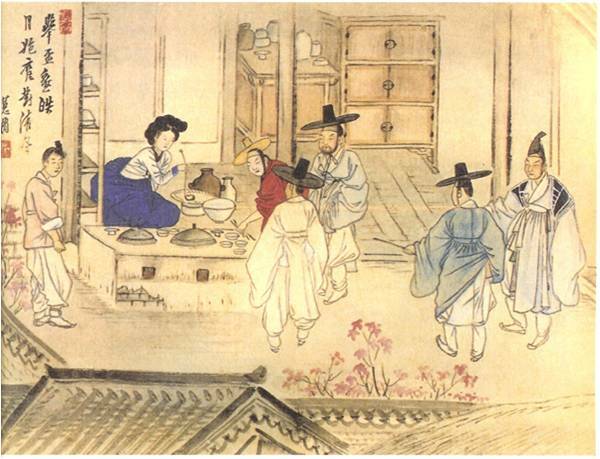 Korea has come so far in fifty years, how have women driven that growth? 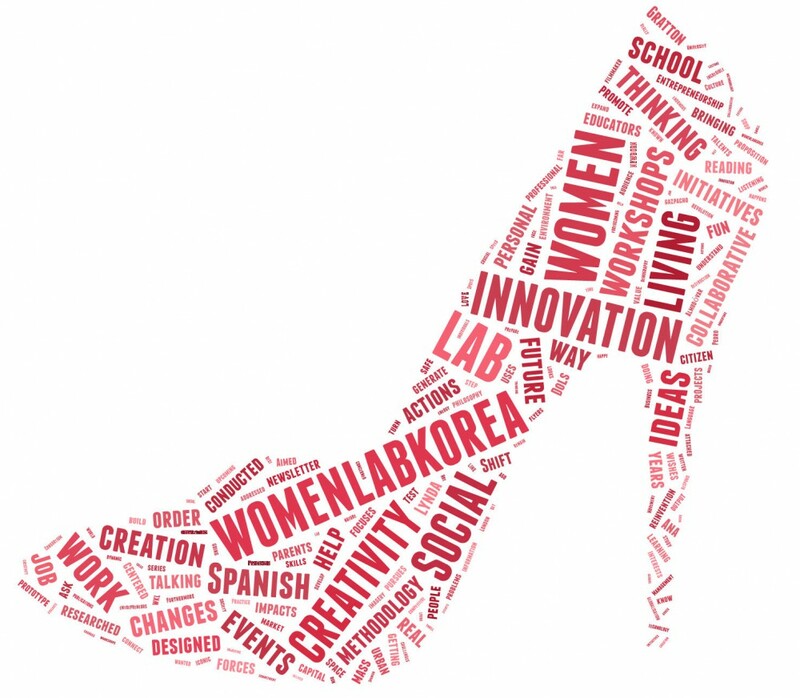 ; What are the challenges that women face in Korean society? 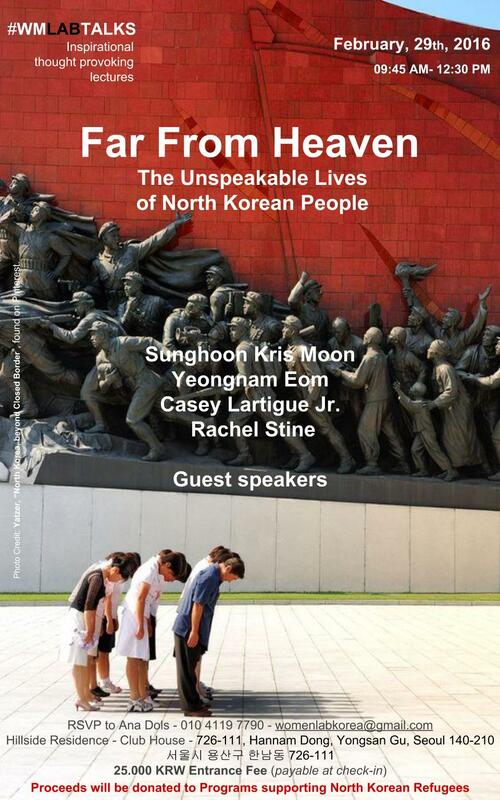 ; What are the challenges that South Korean Women will face in the future? I think that this World Café was able to deepen the discussion about being a woman in South Korea and maybe widen our viewpoints. 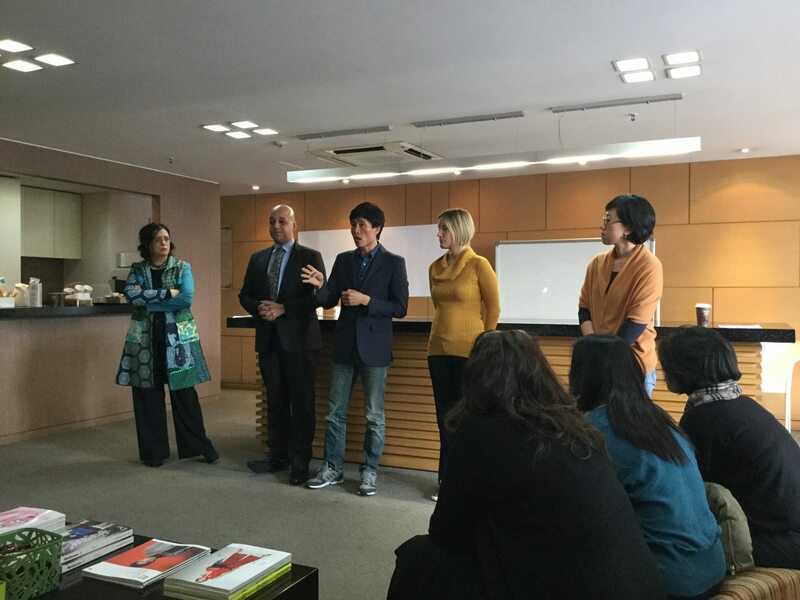 After the storytelling we toasted with Sogokju and we could not find a better closure for our workshop than to read, both in Korean and in English, some excerpts of Simcheongjeon a story of Korean Pansori storytelling tradition. 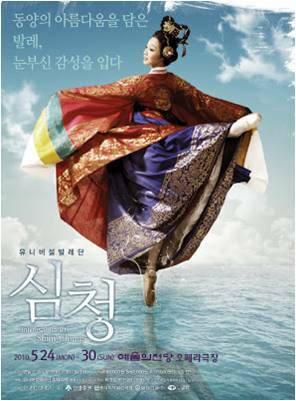 Simcheong is a girl whose mother died in childbirth. She cares for her blind father… She is the perfect model of Confucian devotion…We found interested to end with this story and use her “own” words to foster our imagination, forgetting about the story and focusing on the philosophical message. 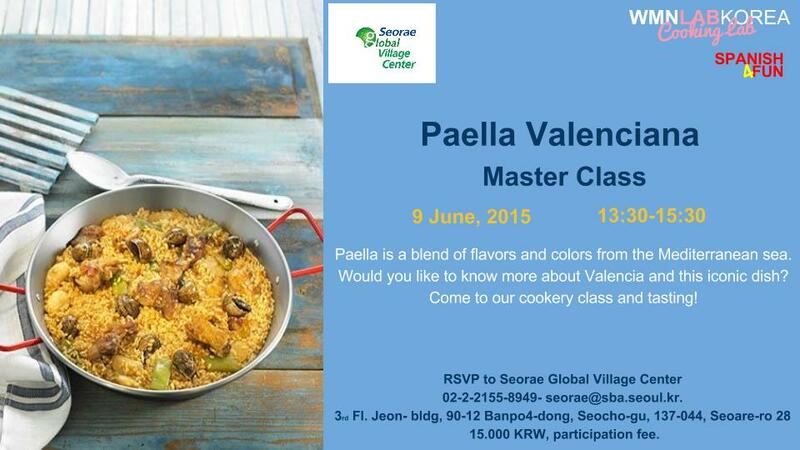 Korea meets Spain: labs to dive deeper into the Spanish food and culture. There is not just one Spain but many. Spain is diverse and there are surprising attractions at every turn. Korea meets Spain wishes to show up different elements about the Spanish food and culture as well as to look beyond the Spanish clichés of siesta, sangría, paella or matadors. Seoul Forest Sculpture by the Spanish artist Jaume Plensa. 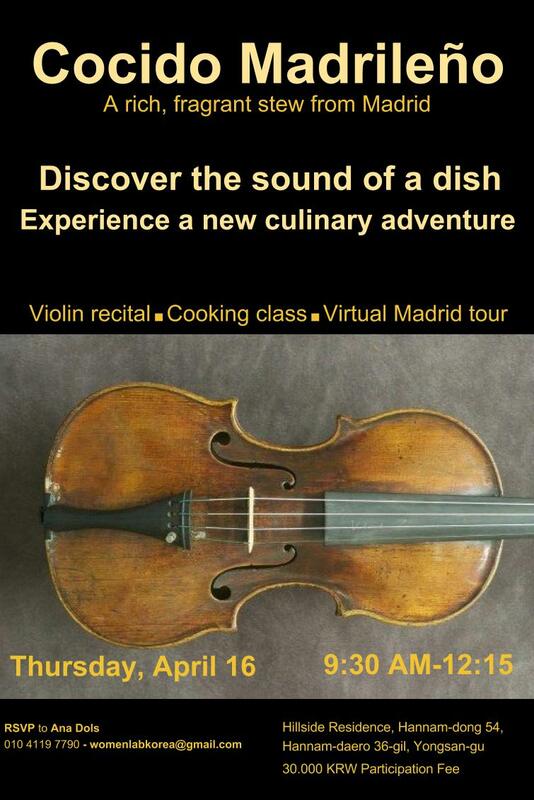 A Spanish4Fun–Cooking Lab event. Cocido is a traditional chickpea based stew from Madrid that dates back to the middle Ages. Fragrant and substantial, Cocido is prepared with meat and vegetables and arrives at the table in three courses, known as tres vuelcos. The broth with noodles precedes the legumes and vegetables, which in turn set the stage for the meat. The audience will enjoy a breathtaking view to Seoul’s skyline in a 250 m2 empty flat only furnished with the perfect table to enhance this Womenlabkorea Luncheon. We will cook the Cocido’s recipe and while our stew is over the flames we will make a virtual trip to The Madrid of the Spanish Habsburgs, known as “the Austrians” in Spanish and will admire the Plaza Mayor, silent witness of bullfights, executions, and coronations. When overwhelmed by the echoes of the secret culinary life of the crypto-Jews back in the 16th century, a solo violin by Sammy Park will set the stage for the three vuelcos. A #WMLABTALKS event. Inspirational thought provoking lectures. We will talk about the future of work and the key shifts that women can make to prepare themselves to a future-proof career. 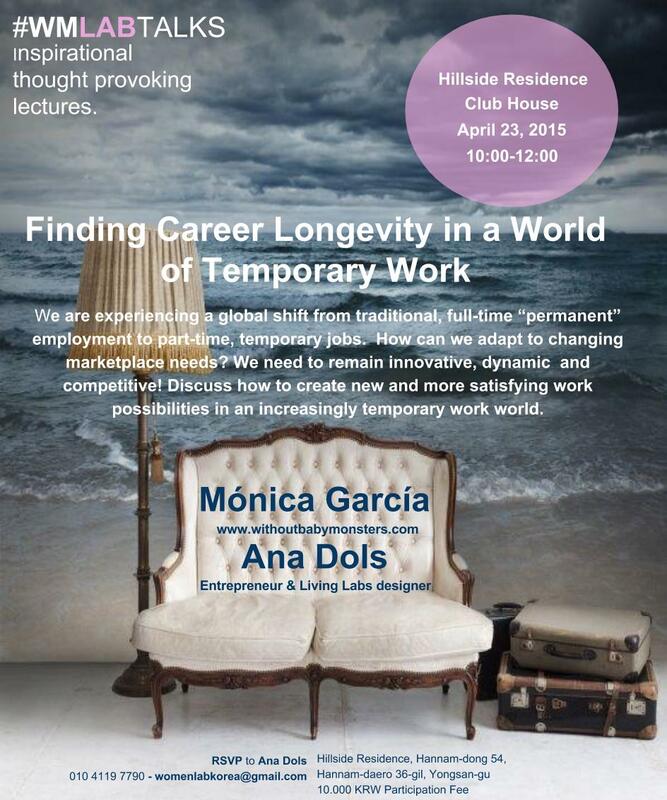 Example of both personal and professional reinvention, we will interview the Spanish blogger Mónica García Cabello. A #WMLABTALKS event. Inspirational thought provoking lectures. 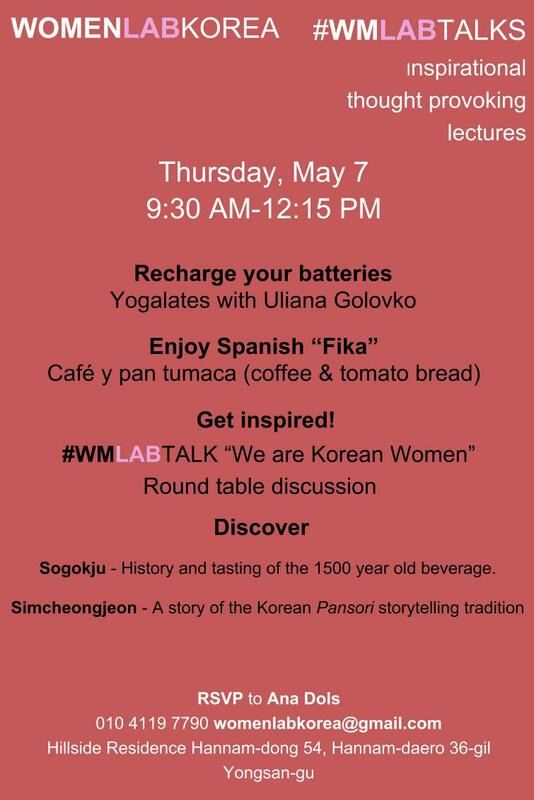 A Korean journalist, Hye-Rim Kwon and Ana Dols, the Spanish catalyst of WOMENLABKOREA, will talk tête à tête about how do Korean women look at their past and face modernity. 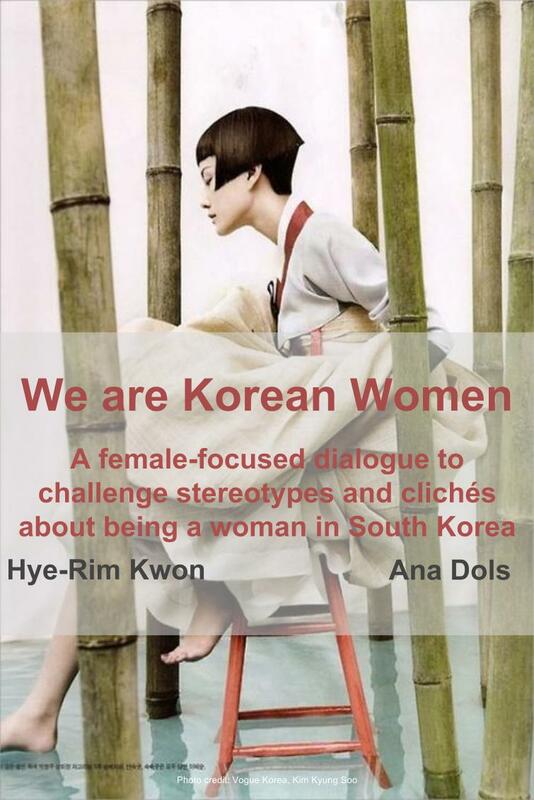 WE ARE KOREAN WOMEN will be a female-focused collective dialogue to challenge stereotypes and clichés about being a woman in South Korea. We will practise yogalates with Uliana Golovko and we will taste our Spanish “FIKA” -we like the idea of Swedish FIKA but we fuse it with the signature pan tumaca Catalonian breakfast or snack-. 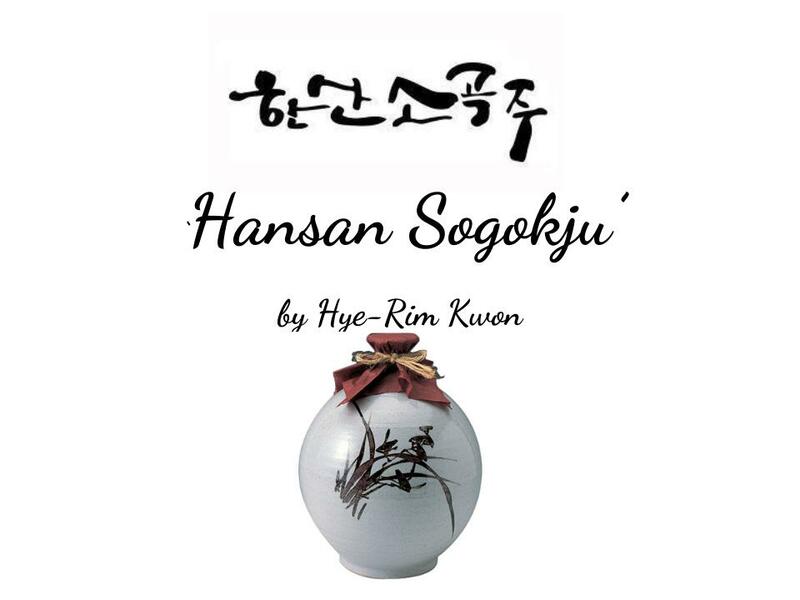 Finally we will discover Sogokju –and we’ll taste it!-, the 1500 year old beverage, and be captured by Simcheongjeon, a story of the Korean Pansori storytelling tradition. 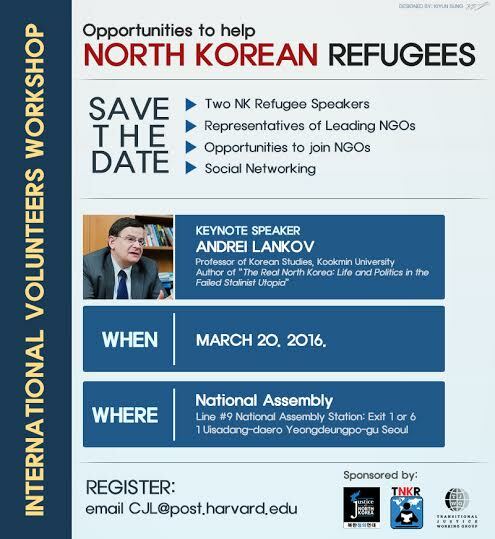 More than a workshop, WE ARE KOREAN WOMEN will be a celebration. A Spanish4Fun-Cooking Lab event. Churros, the Spanish fried-dough pastry, are already part of the mainstream Seoulite culture, where there are currently 21 franchise churro brands, 17 of them registered last year. Churros are the quintessential Madrilenian breakfast. Either thin (or sometimes knotted) or long and thick, they are eaten dipped in hot chocolate or café con leche. 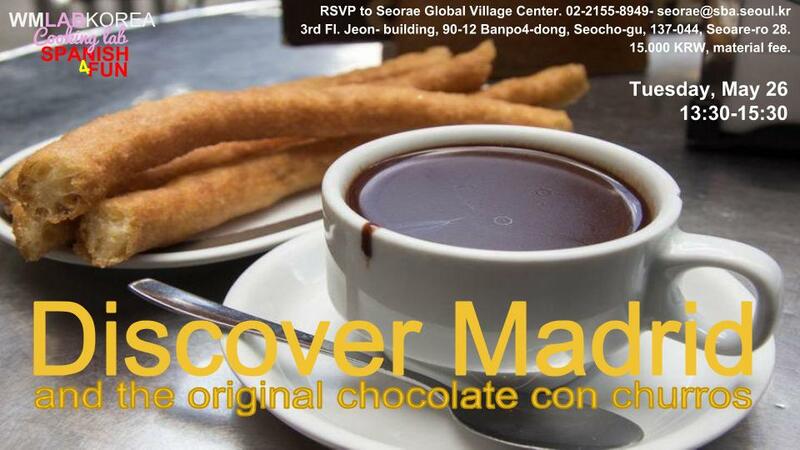 The recipe in hand, we will be making our own churros and dunk them in a very thick chocolate -the authentic one- dip. And while we indulge ourselves with this popular snack, we will discover the controversial history of churros’ origin, the Latin American variations of the churros, or where to have the best chocolate con churros in Madrid, a city made for foodies. A Spanish4Fun-Cooking Lab event. The worldwide-known Paella is a blend of savors and colors from the Mediterranean Sea. The origins of this iconic dish are humble, Paella was originally farmers’ and farm laborers’ food, cooked over a wood fire for the lunchtime meal and traditionally eaten straight from the pan. It was made with rice, plus whatever ingredients were to hand around the rice fields and countryside (the so-called Huerta). We will try the original Paella Valenciana Recipe and travel to Valencia, whose sunlight was the painter Joaquín Sorolla’s inspiration. Survival Spanish. 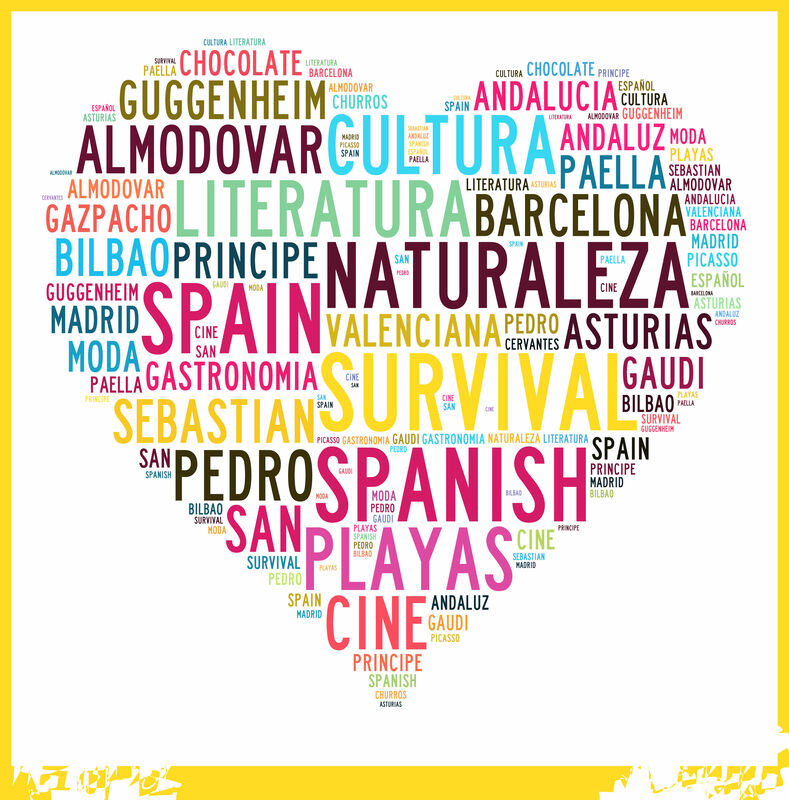 Spanish smarts for smart tourists. A Spanish4Fun event. Five sessions to help participants to navigate their way through some common scenarios (at the airport, traveling around the city, at the bank, in a restaurant, …), whether they are in Spain or Latin America. Survival Spanish will be useful either to brush up on the Spanish participants already know, or to learn all the useful words and expressions they will need for their trip. We will learn Spanish smarts about the Spanish language, social life and culture. Are you ready to be surprised?.